Wolfpak 72-106 Over Here model aircraft transfers Decals "wolfpak"
First up on this sheet is an A-25A or the AAF’s version of the SB2C Helldiver used as a target tug. It’s followed by a P-38L of the 24th FS based in the Panama Canal Zone. Something a little different is a C-53, or militarized DC-3 used by Northeast Airlines but still carrying national insignia. The B-17D, “The Swoose”, as it appeared in 1943 while used as a transport is our third subject. This one has a small panel of flags of the countries visited at this point in time. 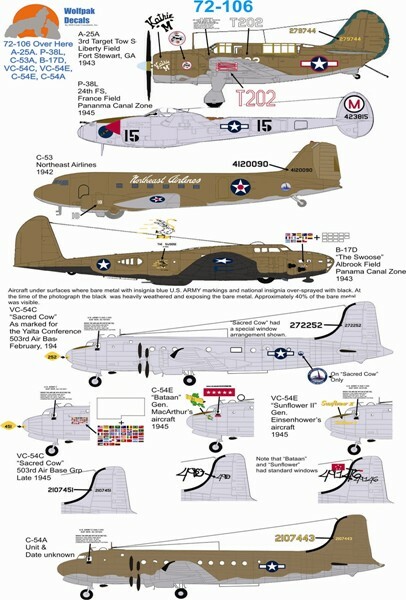 The sheet’s final subject is a C-54 with options for a O.D. over Neutral Grey transport and options for 4 VIP aircraft. The foremost being the use by both Presidents Roosevelt and Truman as Air Force One. There are two options for this version one being the one used by Pres. Roosevelt on his trip to the Yalta Conference complete with bogus serial number applied to the tail for security. The second option being the aircraft as it appeared when Pres. Truman used it complete with a rather large flag panel of the countries this aircraft visited. The last two options are for the personal transports for Generals MacArthur and Eisenhower.